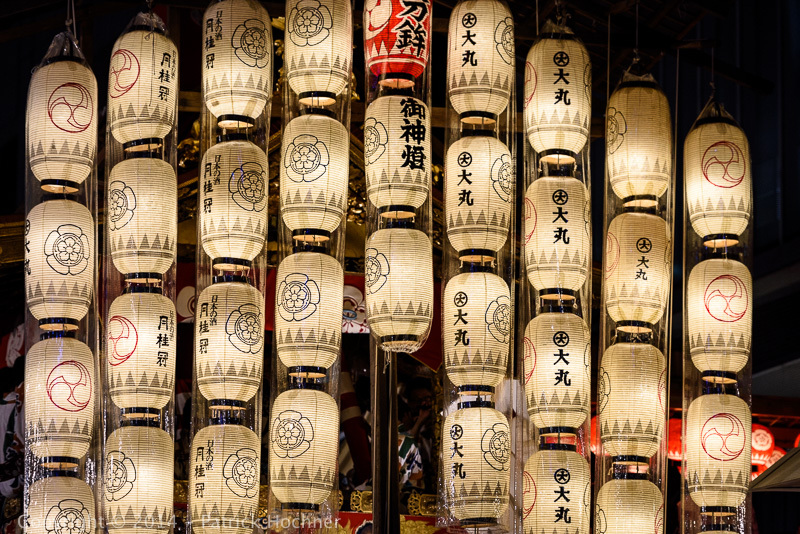 Gion Matsuri is simply the largest festival in Japan. And this was the first time I had a chance to attend it. Yes, I’ve lived for over 25 years in Japan, but I was in Tokyo and during all this period, I have spent very little time in Kyoto. Now that I’m back in Japan and have settled in Kyoto, things are going to be different. I didn’t really know what the festival was actually about, I mean how to approach it to best enjoy it and see it. 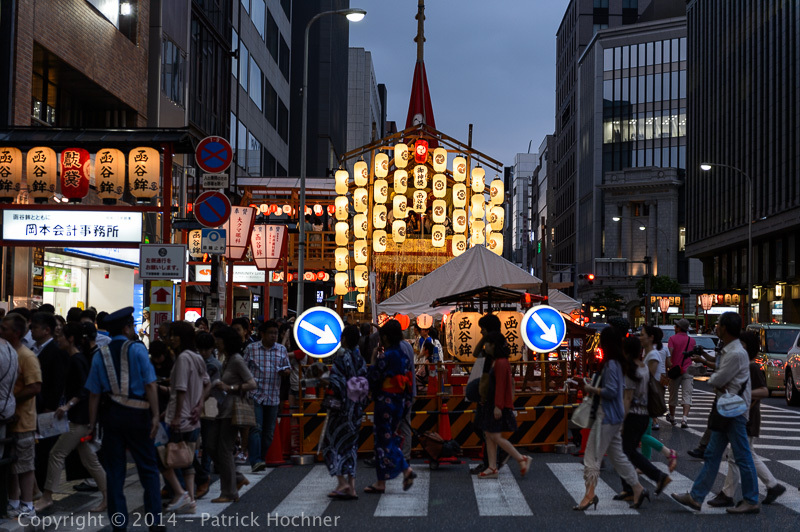 Gion Matsuri goes on for the whole month of July and there are events left and right in the city, in various locations, various temples. Many of these are small local matters and except for the main events, it is quite difficult to find proper and useful information. But the procession of floats (Yamaboko Junko) on July 17 is the main event and is particularly spectacular. The atmosphere in the city changes as the date of the procession approaches. And the three evenings preceding the procession (Yoiyoiyoiyama, Yoiyoiyama and Yoiyama) are festive and enjoyable. After being put together these huge floats are displayed around the center of the city, illuminated in the evening by numerous lanterns (representing ship’s sails). The people, many of them wearing colorful summer yukata, move around to see these. The streets are closed to traffic and the area is full of food stands, drink vendors, and all kind of other little shops. And people eat and drink everywhere, and take pictures. 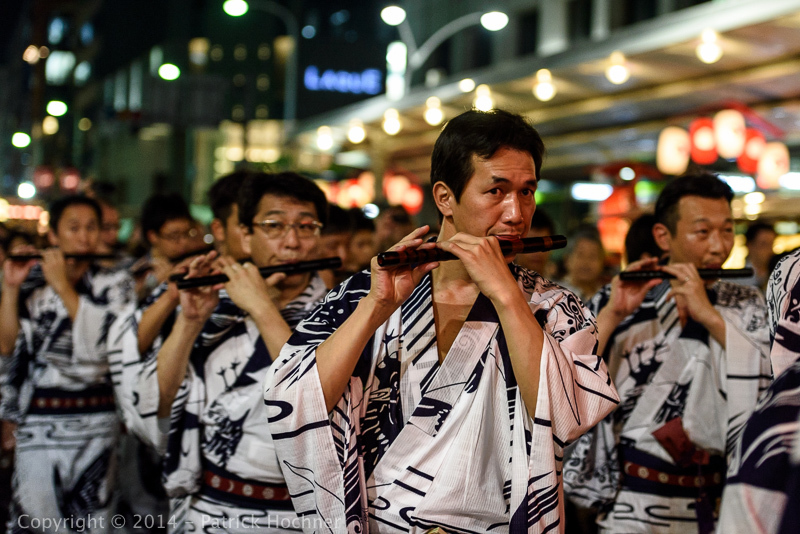 And then on July 17th, the processions of floats (Yamaboko Junko) starts at 9:00. We arrived a bit earlier to be sure to find a good spot, but actually, the procession route is quite long and last for a few hours, so it is not that difficult to get a good look at it. The procession starts at the crossing of the Shijo and the Karasuma streets and goes along Shijo, Kawaramachi and Oike streets. This year, after 48 years, a second smaller procession took place on July 24. Here are a few pictures taken the three days preceding the actual procession day.